If there are two things that Alberta is famous for, it’s our snowy winters and our proximity to the Rocky Mountains. Put those two things together and you’ve got yourself some seriously stellar ski hills come winter (and most of fall and spring, if we’re being honest here). You don’t have to head to British Columbia to get on a grade A run, after all, as one of the best things about Calgary is the close proximity to the mountains. In just a matter of hours you can make it from your front door to the top of some world-class mountain resorts. Check out some hills close to the city that will let you hit the slopes ASAP. Getting your snowboard on has never been easier with a park right inside Calgary City Limits. WinSport offers tubing, skiing, snowboarding and much more. Nakiska’s close proximity to Calgary makes it the perfect destination if you don’t like travelling on icy roads or just want to do a quick half day. For Olympic grade skiing, Nakiska is actually a great option. The Mountain was built from the ground up for the 1988 Calgary Olympic Games, and is home to Olympic grade runs and some of the best snow-making equipment around. The tube park is also a bonus! Norquay Resort is extremely close to the Trans-Canada Highway which makes it a breeze to get to. Not only does Norquay offer special sightseeing packages, but they also offer “Toonie Tuesdays” on select days when you’ll be able to ski or snowboard for just $2. Sunshine Village offers all of the skiing and snowboarding your heart desires. With tons of snowfall, Sunshine is often open later than most mountains in Canada, AND they have the first heated chairlift in the country! 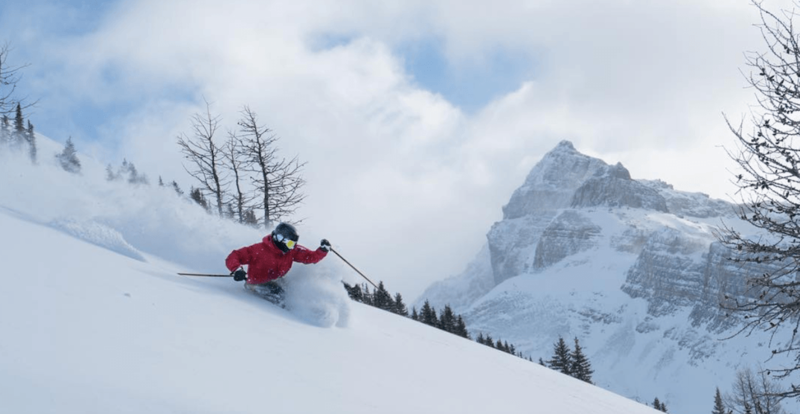 Instead of heading West to hit the mountains, most don’t think to head North, But in Southern Alberta lies Castle Mountain, your premier ski and snowboard destination. The hill offers over 80 runs, lessons, snowshoeing, and even cat skiing. Lake Louise’s 4200 skiable acres of world-class terrain makes this a hot spot for skiers and snowboarders. The hill has numerous beginning, intermediate, and black diamond runs which makes it a perfect place for shredders of any capability. Central Alberta Represent! Canyon Ski Resort is located in Red Deer, Alberta, and offers a large array of specials from college nights to Thrifty Thursdays. Hidden Valley Ski Resort is a truly hidden valley, tucked away in Alberta’s Cyprus Hills Provincial Park. Stunning views of Alberta’s Prairie and world-class snowmaking machines make the hill top-notch. Located in the heart of Jasper National Park, Marmot Basin is located right inside the Canadian Rockies, which make it a great place for guaranteed fresh powder!